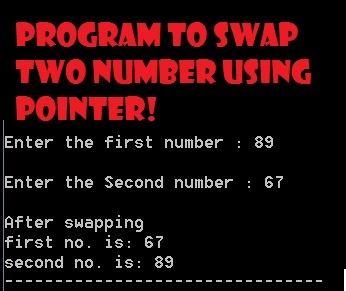 Here is a simple C++ Program that show the use of pointers to Swap Two Numbers or Variables using Pointer. You need to enter the numbers and your number will be reversed or swapped. Lets see the program. Swapping Two Variables using Pointer Firstly we need to accept two numbers using cin statement this. Now You need to pass the address of both variables to the function we used & operator to give address of num1 and num2. swap(&num1,&num2); Parameter passing scheme is called as Pass by Pointer. Now Take a look at function definition, We have passed address of two variables from main function to swap function. So we need variable container that can store the address of integer variables. Thus address of first number will be collected in “num1” pointer variable and second number will be collected in “num2” pointer variable. temp =*num1;*num1=*num2;*num2=temp; is used to swap number from one to other.